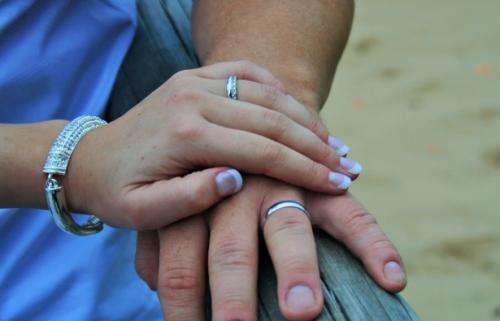 Men and women both report greater marital satisfaction with younger spouses, but that satisfaction fades over time in marriages with a significant age gap between the partners, new University of Colorado Boulder research finds. The findings, which examined 13 years' worth of longitudinal data from thousands of Australian households, also suggest that marriages with large age gaps are less resilient in the face of economic downturns relative to their similarly-aged counterparts. The study was recently published online in the Journal of Population Economics. "We find that men who are married to younger wives are the most satisfied, and men who are married to older wives are the least satisfied," said Terra McKinnish, a professor of economics at CU Boulder and a co-author of the new study. "Women are also particularly dissatisfied when they're married to older husbands and particularly satisfied if they're married to younger husbands." "Over time, the people who are married to a much older or younger spouse tend to have larger declines in marital satisfaction over time compared to those who are married to spouses who are similar in age," said McKinnish, who is also a research associate at the Institute of Labor Economics (IZA) in Germany. One mechanism for this decline could be how the age difference between spouses affects the couple's ability to respond to negative economic shocks, such as a job loss, McKinnish said. "We looked at how couples respond to negative shocks and in particular, if they have a major bad economic shock or worsening of their household finances," she said. "We find that when couples have a large age difference, that they tend to have a much larger decline in marital satisfaction when faced with an economic shock than couples that have a very small age difference." They seem to have missed the most obvious reason for marriage break up in couples with large age difference and the financial shock, the fact that in most of these matchups the financial stability of the older partner is a substantial component of the initial and subsequent attraction.